The ultimate Hilton / Formula 1 points redemption! I often write about how some ‘experiences’ redemptions offered by the hotel groups go very cheaply because they are not well described in the headline, and the real value only emerges when you drill down. You and your guest will fly to the Silverstone Circuit in a private helicopter, where you will be hosted in the premium McLaren hospitality suite, situated above the team’s garage, with the best view in motorsport of the pit-lane and start/finish straight. There is no better place to see and hear the cars up close as they fly by at speeds in excess of 200mph, and the teams perform their pit stops a couple of meters below your feet. Your ultimate VIP experience with McLaren will also include a tour of the McLaren garage where you will be able to have your photo taken next to the cars, as well as driver appearances and access to pit-lane walks. You’ll also be treated to a stay in a themed room at The Trafalgar St James, London decorated with McLaren memorabilia, including race overalls, drivers’ helmets, steering wheels, tires and model cars, as well as much more! This iconic hotel offers chic urban spaces, is located directly on Trafalgar Square and has a popular Rooftop bar with incredible views of London. Not bad! At the time of writing the highest bid is 550,000 Hilton Honors points. OK, that sounds like a lot – it is a lot – but you would only get £1,800 of free hotel rooms for that. I doubt that you could actually buy the package I detailed, but I’m sure if you could you would be looking at £10,000+. Private helicopter charter doesn’t come cheap. Bidding closes on 30th May. Best Western has brought back its ‘Breakfast Is On Us’ promotion. Bookings made at 180 UK hotels between now and 30th September 2018 will have complimentary breakfast included in the room rate. There is no promo code and no special landing page. You must be a member of Best Western Rewards however. 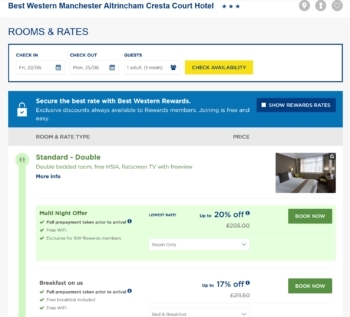 Simply book via the Best Western home page between now and 30th September, choose the hotel and date you would like to book and you will see the ‘Breakfast On Us’ option. OT: Having issues adding a supplementary card on my Gold Amex online. Tried yesterday too. It keeps giving the message, “Please call the number on the back of your Card to add a supplementary user to your Card account.” If I call and request one or request one via chat, will I still get the 3,000MR points? Tried ordering supplementary on my partner’s platinum log-in and there were no issues. Thanks. The 3,000 MR are not advertised as a promotion for all. I could try but I have a feeling they will say I don’t actually have that offer on my account. This is the Gold Amex credit card rather than old charge card, I assume? If yes, can any HPFers provide any recent evidence/confirmation that the new Gold credit card iteration actually pays out 3,000 MR for adding 1 x supplementary card? I’ve been thinking about this for a while now, but had been waiting to hear if any HFPers had had any success in getting these 3,000 points? Ok, found the UK number(44-20-7012-7312) so will try once they are open. This is a short term trial, only shown to a handful of customers. Avios asked me not to cover it because it would upset all of the NatWest and BOS customers who don’t have it. It is going away soon. Ah, better transfer some across soon then before it goes away! Will hold off the credit card application to see what happens in the longer-term! I did well out of the Morrision’s one last time (benefits of moving back north). Amazon gift cards or Morrision’s gift cards that are then used for petrol outside. It would be a return to old habits. I used to have a NatWest Visa card until they stopped awarding Air Miles. This was about the time that Sainsbury’s shopping accrued Air Miles. Worth mentioning that the earnings rates are personalised and there are a few travel related options and offers. So when logged out, P and O ferries is 1%, whereas when I’m logged in I get 5% back on all P and O spend. Waitrose is 6%; pretty significant if you shop there every week! That would be a head-turner for Waitrose shoppers, uncertain whether their VFC miles are ever going to post. Here’s a thought. Wonder what is better 2% on council tax or 1.5 Avios if you put it on your Amex? Let’s say council tax is £150, that would be £3 back. That would be 225 avois. Guess it depends on how and what you value your Avios for. £1.33/Av? Sure you can probably redeem for more but I’m taking cash (accepted everywhere; useful even in small increments) every time. unless you have a specific high spend that can’t go on amex you’re far better off with either a BAPP or SPG amex to collect avios via a credit card. I have the misfortune of taking a 640am Ryanair flight from Stansted. Should I get a room in the Radisson for £108 or the Hampton by Hilton for £84, I’m Radisson Gold but nothing in Hilton. If I get fast track security, how late can I get to the airport, I’ve heard it can be very busy on Friday mornings. No one else flies early enough…. no checked luggage, are the queues bad even in fast track? Won’t be in hotel long just wondered whether Radisson was sufficiently nicer to justify the higher price. Security lines are usually efficient in peak hours even in regular queues (those next to fast track entrance are faster). I’ve never spent more than 10mins in 30+ visits. Many thanks for the heads up on this one Paul! I had absolutely no idea that it was available until now. I just jumped on it with a 2 X £50 redemption from my “savings” over the past couple of years or so. I was just waiting for something to come up which suited me, and this one does for sure. O/T Qatar major devaluation for Qmiles, would of liked a bit more notice! OT free hour of WiFi on my Doha to Canberra is just fine for catching up here. And for the person asking about the poor guy in Oslo whose bag we had, he took it very well ( for some reason the luggage guy put my husband on the phone to him) he was there to fix a car and the tools he needed were in the bag, he didn’t want to wait for delivery so was heading back to the airport to collect. Meanwhile one of those Avios earning tags from last year has been attached to my husband’s bag. We took the Oryx Rontana as our free overnight in Doha which was fine it is Ramadan so I can’t comment on the wine prices. I’m Hilton gold from my amex plat at the start of this year. If now have plat supplementary from my wife’s plat… Will that extend my HH gold for another year? 800,000 points that went for in the end. Whoa. Although arguably a good deal if you assume you’re ‘only’ giving up £2600 of free hotel rooms.